In recent years, a large focus on common core subjects has manifested in your child’s educational curriculum. These courses are very important, allowing your children to excel and be better prepared for their futures. However, there is more to your child’s development than just math, science and history. Their creativity, passion, and other important life skills stem from art education. Art classes offers the opportunity to learn new skills and benefit greatly both cognitively and emotionally from experiencing art, first hand. Perhaps the most basic benefit of art education for a young child is motor skill development; using the various instruments in an art classroom will encourage the development of small muscles and fine motor skills. Many children struggle with this as they grow, so giving your child a creative and fun outlet in which to harness those skills, without even realizing what is happening inside their own bodies, can be can be significant in your child’s growth and development. Fine motor skill development is important as young as 3 years old! Not every child will be able to naturally discover their gift for art, so even if your child is more of a color-outside-the-lines type, it doesn’t mean they won’t benefit greatly from experiencing a formal art class. Your child will begin creating art and instantaneously experience emotional satisfaction at having been tasked with something to do and completing that task. Whether your child is two years old, or approaching their teenage years, any age can benefit from a bit of emotional satisfaction. Emotional satisfaction, according to Earlychildhood NEWS, will encourage your child to make his or her own decisions and own them, giving them a sense of self-satisfaction. While completing their tasks, be it drawing with crayons or working with oil paints, solid and valuable self-esteem is established. Making art boosts a child’s self-esteem by giving them the chance to express what they think and how they feel. Your child will also learn to work with others in an art class setting, which can build the kind of self-esteem that’s necessary in everyday life to take in criticism and praise without emotional distress. Kids also benefit cognitively from making art. For toddlers and even younger children, making art helps to explore their senses and interact with the world around them, like finding that dragging a crayon across a page produces a line of color. Older children are able to use art to help them learn how to properly make decisions and reflect on themselves. Your child isn’t only learning what the function of a pencil is in an art class; he or she is learning how to express the things that they feel on paper. Later in life, this skill will foster good communication among peers and colleagues. Creativity is developed and encouraged! Creative thinking is so important in this day and age, and your child will learn that in spades in an art class. Art will encourage your child to think outside of the box and by developing this skill at an early age, could help your child think creatively later on in life. Thinking creatively also helps to develop problem solving skills. Your child will be faced with a problem, such as looking at a blank canvas that is supposed to show a picture of an egg. Instead of stressing the details, your child will learn to dive in, think on their feet, and solve the problem. Many of us have difficulty with this skill in everyday life, so fostering it in your child when they are young is so important! 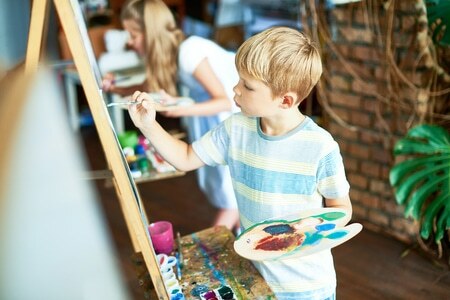 According to PBS, studies show that there is a correlation between taking art classes and academic achievement among children. It seems as though young people who are able to take advantage of art education are even more interested in their academic lives and will see increased success compared to kids who don’t participate in art classes or a similar after school activity. Art classes can help your child grow and develop their creativity, fine motor skills, problem solving ability, communication skills, self-esteem and socio-emotional abilities, and much more. Plus, it’s a great way to expose your child to a hobby or after-school activity that might be outside of their comfort zone. and watch them grow and mature as the weeks go by. Here at Hunakai Studios, we know that your child’s growth, development and creativity need to be fostered in the art classroom—all while everyone is having a great time, making new friends, and preventing the summer slide. We have a plethora of summer classes for kids that explore everything from modern art and bookmaking, to watercolors and drawing! Register your child today by calling us at 508-543-5665 and if the summer is jam-packed with soaking up the sun, feel free to browse through out art classes that run throughout the year!